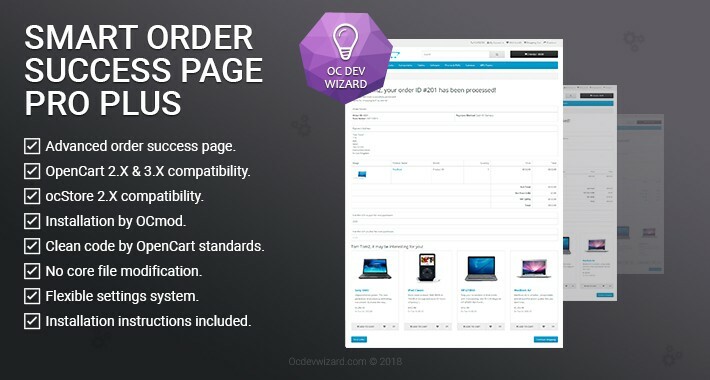 Advanced order success page with detailed information and marketing tools. You can customize order success page to make it more unique and useful. 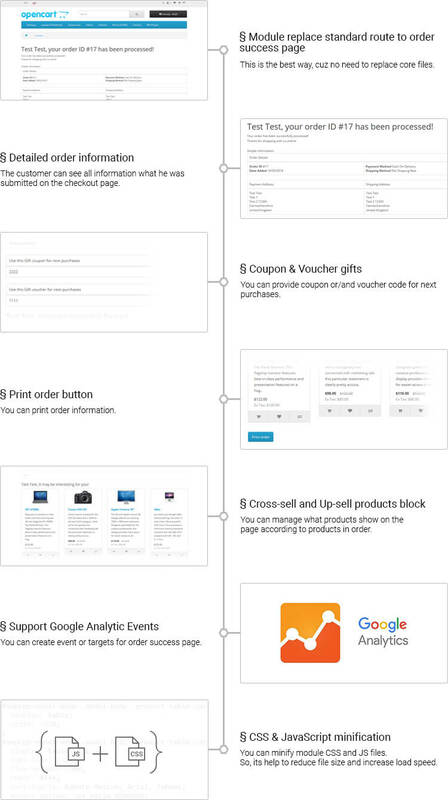 ☑ You can show additional information for customer. 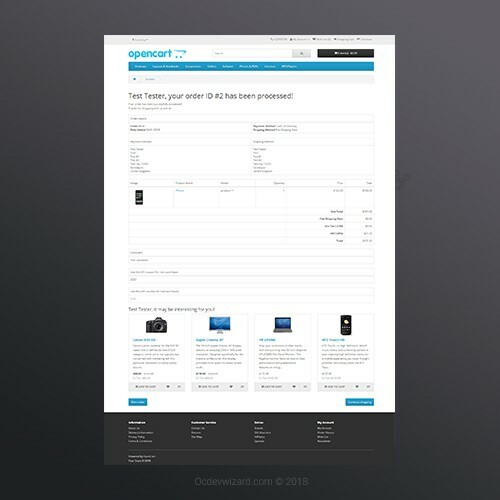 ❏ Please use my free "Smart Verify System Сompatibility" extension to check your system compatibility with this module before purchasing. ❏ Minimum PHP version: 5.6. ❏ Installed ionCube Loader v10 and higher. ❏ Module works on localhost also, but need active internet connection. ❏ Please use my help desk system to request support. ❏ Please use the comments for pre-sale questions only. ❏ Please do not use the comments for errors reporting, such messages will be ignored and deleted. ❏ Technical support is provided free of charge. Note that the paid technical support is performed in cases where there is a conflict with an outside modules/products/templates. Please take this with the understanding that the developer can not make own module 100% compatible with all outside extensions. That’s why in some cases, it is necessary to adapt the module to not standard store configuration and system settings. That’s why the solving of such problems will be paid separately from the cost of the module. ❏ You can use the module on only one domain of your website (example http://site.com), and it is not limited to use on subdomains of this domain (for example http://test.site.com or http://site.com/test/). ❏ You cannot sell/resell the module without written consent from the developer of OCdevWizard. ❏ You cannot present/resend/distribute the module without the written consent from the developer of OCdevWizard. ❏ You cannot present module from OCdevWizard as your own. Please respect the time and efforts of the developer. 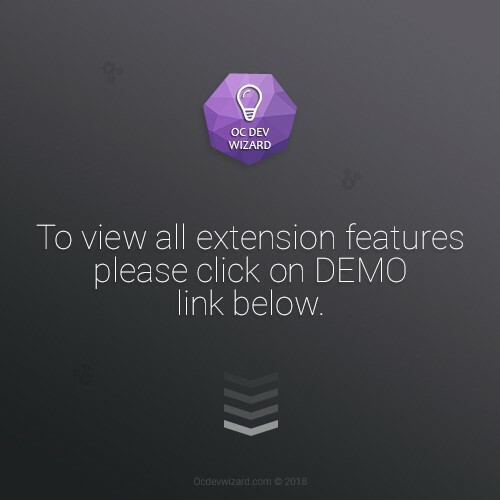 ❏ You cannot remove the copyright of the developer from the module of OCdevWizard. ❏ You must use my help desk system to activate module license. everything is perfect from extension to support. recommended!!! Good customer support and quick response. Top notch extension and professional developer. Recommended!